If you’ve been toying with the idea of upgrading your home security camera system to Arlo but the hefty price tags have given you pause, today is the day you’ve been waiting for. For one day only, Amazon is running a big sale on Arlo systems, add-on cameras, and even accessories. 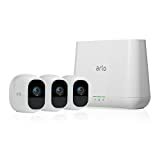 You can save $230 on an Arlo Pro 2 system with 3 cameras, save $270 on an Arlo Pro system with 5 cameras, or get Arlo add-on cameras for just $99 a piece. There are also a bunch of accessories like mounts and outdoor covers that are on sale right now at a discount. Check out the full sale right here on Amazon’s site, and you can also see our five favorite deals listed below.